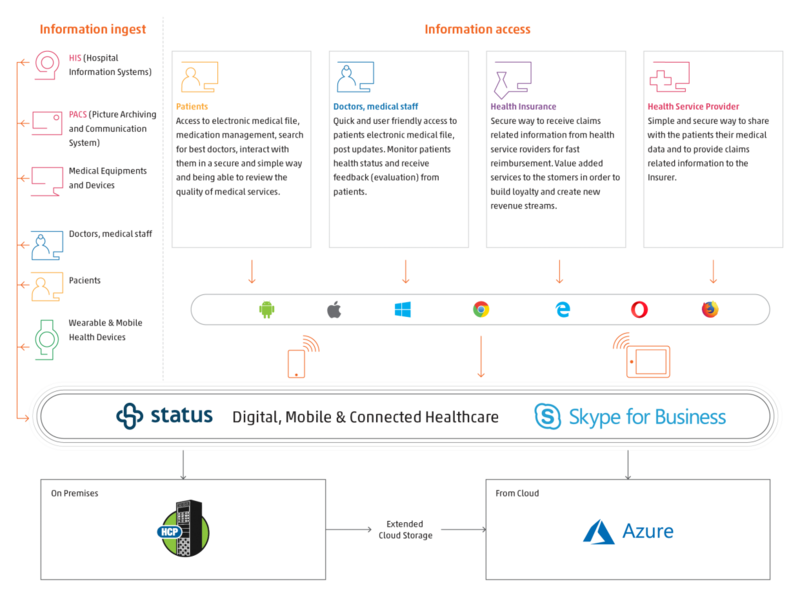 The integration with Skype for Business and Azure fosters team collaboration and increases efficiency, helping the entire medical ecosystem to provide better healthcare services at lower costs while improving the overall patient experience and engagement. Designed to help your healthcare business to be successful in a fast-changing digital world, to treat more patients, get reimbursed faster and stay ahead of change. Permanently connected, engaged and healthier patients. World-class services built to scale - on your desktop, tablet, and smartphone. Excellent capabilities for Electronic Medical Records governance and long-term preservation. Eliminate the need for frequent medical appointments or poor patient experience do to long waiting time for routine consultations. Take the interaction between patient and healthcare industry to the next level with zero-distance video-enabled healthcare. Foster team collaboration and efficiency to provide better and personalized healthcare services at lower costs while improving the overall patient experience and engagement. Quality insights on medical data to support decision process based on consistent information acquired in real-time. Unprecedented opportunities to better manage the health of patients with chronic conditions while sitting at home. Reduce readmission rates and home visits. Provide the same level of healthcare services seamless of patient’s physical location. Significantly increase the efficiency of the healthcare system through a secured on-line environment for patient-doctor communication available anytime, anywhere enabling patient engagement and advanced collaboration on medical data. Quick and user-friendly access to patient’s files and history, including family history components, both for patients and doctors. Selection of appropriate physicians for a first or second opinion at the patient’s request, who can also see their profile and rating. Patient feedback for medical services. Web App and Mobile clients for iOS and Android. Low-cost electronic medical records governance and long-term preservation.